Morwhenna. The Creative Adventurer: Why bother doodling? If you are already an avid doodler then you'll know the answer. If you are not or you are looking for a fun and easy way to re-ignite your creative spark - then I've got the match. This Sunday 01 February I’m running the next Mini Doodleicious Exploration and wanted to let you know there are still some tickets available to join in the fun. And I promise it is lots of fun! 1) Why bother doodling? It’s a waste of time. Time I have little of already trying to fit in all the things I want to do! My response to these two questions is – I don’t teach you how to doodle, you’ll have your own doodling style. It’s much more about how you can use doodling as part of your wellbeing toolkit. Yes I have some different games and techniques to share with you, but you'll still do these in your own way. There is no right or wrong with doodling. Its very freeing. This to me is VERY exciting. And as I discovered on the course I ran last year – allowing yourself to doodle – to have permission for it not to be perfect and how it actually helped some of my lovely doodlers overcome a fear of drawing. It was pretty epic! Plus it’s FUN! [Serious bit coming up] I use doodling for all kinds of reasons. I suffer from bouts of depression and can go from feeling as happy and bouncy as a lamb to being stuck down the dark recesses of a rabbit warren with no visible means of escape. Over the years I've learnt to recognise this much more clearly and am able to call on the different tools in my kit bag to stop me slipping too far down that rabbit hole. I know what it’s like in there and I don’t want to be back in that space. So if this is something that appeals to you and you’d like to see how doodling could help you – Come and join in the fun! You might just surprise yourself! OR if you are thinking – ooh I bet my friend…. [fill in the gap] would love this and so would my sister/brother/auntie…you get the idea! Please do share the details with them. Use the share buttons at the bottom of this post. Share it with whoever you think would benefit. I’m all about sharing ways to re-discover or un-cover your creativity for a richer and juicer life. 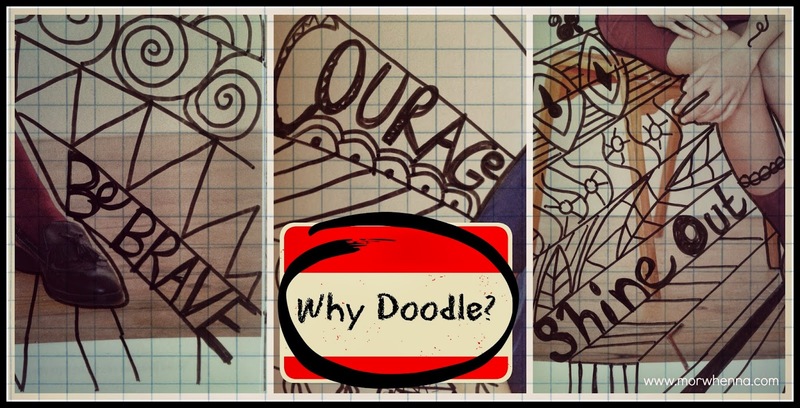 I basically want to help as many people as I can and am on a bit of a Creativity Mission so can you help me by sharing about the Doodleicious-ness far and wide? A heart felt thank you to you. What have previous Doodleicious Explorers got to say about it? Looking forward to each day's challenge and wondering what fun task it will be. Knowing that a doodle doesn't have to take long and doesn't have to be perfect. It's just been great fun. It's interesting to see other people's ideas and I haven't felt that my efforts were inferior even though technically some of them really were! Some other lovely things...including a super film done by one doodler! 1. Doodling is more fun in colour, the brighter the better! 2. Doodling can help me focus & concentrate or it can totally distract me & help me relax - both can be useful! 3. I am more creative than I thought, despite my lack of talent in some areas! For the full low down on the Mini Doodleicious Exploration and how to sign up for the cheeky price of £18 (includes a tree planting)– make your way over the Doodle Page! As a creative, doodling is something I have grown to love and depend on to keep the creative juices flowing on a regular basis!